Jean Chatman was one of more than a dozen vendors to meet with Whole Foods representatives during this year's Harlem Harvest Fest on October 10. The local baker will get an inside scoop of how to get her desserts in the shelves of the national retailer. HARLEM — The Whole Foods Market on 125th Street and Lenox Avenue is already starting to select local vendors to feature on their shelves once the supermarket opens next year. The national retailer will meet with Harlem-based businesses during the annual Harlem Harvest Fest on Oct. 10. Those businesses make anything from chocolate, to soap, to bagels. “We’ve had 41 applicants and I’ve been really impressed by what’s been submitted,” said Elly Truesdell, who works for the supermarket’s local buyer program. The vendors that have been selected for the meeting will be able to speak directly with Truesdell and other Whole Foods representatives about how to get their products in the store. “Having a chance to meet them in person is an opportunity to give feedback on taste, packaging, labeling and branding,” she added. Some of the vendors will continue working with Whole Foods to get their product ready for sale. Those who are already a little further along will have the opportunity to sell their goods in other Whole Food chains around the city. The national retailer teamed up with Harlem Park to Park to find the vendors. 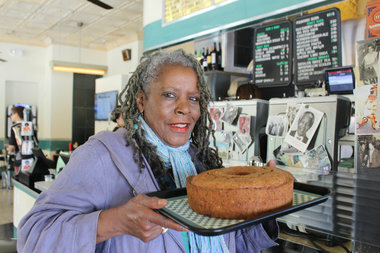 One of them includes Jean Chatman, who won the Harvest Festival’s bake-off competition two years in a row. “To be under the new Whole Foods would definitely be a plus,” she said. Chatman, who sells her baked good at Harlem Shake, BLVD Bistro and Garden of Eden, tried to apply with Whole Foods in the past but was put off by their lengthy list of unapproved ingredients. Also, the Whole Foods brand is associated with health foods and she is a traditional southern baker so she was not sure if it would be a good fit, she said. She is looking forward to have some one-on-one time with a representative to go over her concerns. Some of the other vendors include Bo’s Bagels, Flo & Theo, Harlem Munchies, Harlem Soap Company and Sol Cacao, according to Harlem Park to Park. People will be able to purchase all of their products at the Harvest Festival at Saint Nicholas Avenue and West 116th Street, said Nikoa Evans-Hendricks, founder of Park to Park. Like in previous years, the event will have free events like face painting and pumpkin carving for children and yoga classes and live music for adults, she added. “Harlem Park to Park looks forward to showcasing Harlem’s growing local vendor movement at this year’s Harlem Harvest Festival,” she said.